During the end of a charge cycle, a battery goes through a gassing stage where water is released from the cell in the form of hydrogen and oxygen gas. If the water level is too high at the time of this phase, the electrolyte solution can rise above the cell cap and begin to leak out of the cell. As this electrolyte dries, it creates a powdery substance on the top of the battery that can actually conduct electricity. 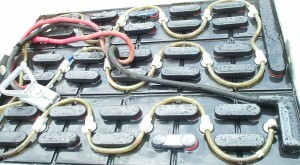 If this substance covers the battery from cell connectors to the steel battery case, electricity can be sent to anything that is touching the case of the battery. This situation can cause your lift-truck controller to become damaged or receive false electrical signals resulting in unusual equipment behavior. 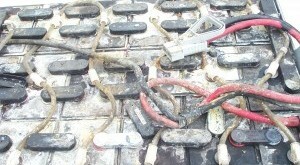 Cleaning the battery will eliminate the chance of stray electric signals. Once this material develops on your battery it can corrode the steel battery case, battery cables and connectors. This damage can compromise the structural integrity of your battery case or even cause your cables to overheat, melting the insulation and shorting your battery connector. This type of damage is dangerous for you operators and can be a hazard in your facility. MCP offers a low cost, on-site cleaning service that will remove the residue from your batteries and leave them in great working order. We utilize a closed loop system that neutralizes acid from the wash water and and complies with current environmental regulations regarding disposal of hazardous/corrosive substances.